Note: this post was originally published on Purcus.com, we have now moved it to it’s new home here on Blogging Wizard. You just had another sleepless night. You had a difficult time clearing your mind from thinking of the future meetings, collaborations, impending deadlines and the massive to-do list you have before your head even hit the pillow. The ding-ding of your phone’s alert instantly causes your heart to race; you need to sleep, but the thought of missing an email doesn’t sit well with you. Running a business as a solopreneur is challenging. It means you can only rely on yourself. It’s no wonder that 80% of small business owners fail within the first 18 months of starting. Yet that doesn’t stop us, does it? As a solopreneur, owning my own business was something I’d always wanted to do. I didn’t even apply for a formal job – I’m not counting my stint working summers at a pizza joint in high school – until I was 27. Other than a few years spent working in my field as a special education teacher, I’ve mostly worked for myself. First, as a private behavioral therapist and now as a freelance writer. But, for many of us, you soon realize you can’t do everything yourself. With the endless tasks that need to be accomplished, rigorous scheduling and bookkeeping on your part, chronic stress becomes a daily occurrence. Your over-commitment to your business – we’ve all worked on the weekends and pulled all-nighters – is ruining your health. From an increased risk of depression to heart disease and even an increased risk of a heart attack, working for yourself is slowly killing you. And while you’re the perfectionist and control-freak that you are, as your business is growing, you can’t handle all the minutiae that comes with it on your own. It’s time to delegate. At first you might not welcome delegation into your life. You want to save money; I get that. You’re a start-up and if there’s a way to bootstrap, you’ll find it. So, instead of becoming master of one, you become a jack-of-all-trades. You handle everything because you want to save money. But, in reality, being responsible for everything in your business will hurt you in the long run. You’ll become unproductive, make mistakes and be constantly stressed out. 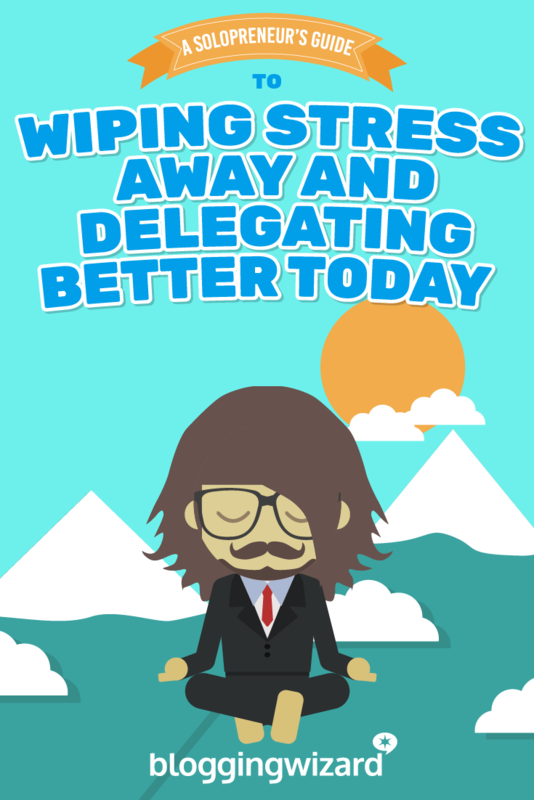 But, learning to delegate tasks is a big challenge for a lot of solopreneurs. If you’re used to doing things on your own or you don’t have the financial resources to hire outside help, delegation doesn’t seem like a viable option. You have to take a hard and honest look at your business growth and your capacity for fulfilling the needs of your business. Once you acknowledge that it’s you who is holding your business back, you can move forward to streamlining your business for better productivity. When you delegate, you’ll be more efficient and more focused to tackle anything that comes your way. Delegating tasks that slow you down or that you don’t know how to do can only make you more efficient with the tasks you do well. This leaves room to focus on tasks that are important to your business’ growth. So, what tasks do you delegate? And, more importantly, what tasks should you hold on to? According to Mel Abraham, the CORES of a business – critical, original, revenue, expansive and strategic tasks – should be handled by the solopreneur and shouldn’t be delegated to someone else. Critical – tasks that are critical to driving your business and profit should be handled by you, or at least, monitored by you. These could include large capital outlays, VIP client dealings (closing leads or pitching your services), financial (paying high-dollar invoices and expenses) and the general direction of your company. Original – avoid delegating original core business ideas like your business name, branding elements and your image. As a solopreneur you want your business to reflect you, not someone else’s idea of you. Revenue drivers – make sure to closely monitor client relationships and sales as this is an indicator of your business growth. Expansive – be responsible for spearheading campaigns and big innovative ideas. While this is a perfect place to delegate the execution and implementation of these campaigns, it’s your duty to oversee everything. Strategic – stay close to the true vision of your company. Avoid delegating out the strategic plan for your business growth. You are the one to navigate where your business is heading. So what types of tasks can you delegate out? Typically, administrative and organizational tasks that need to be done regularly or on a daily basis are perfect to automate or delegate. These tasks are usually time wasters and can be easily streamlined. You’ll also want to delegate tasks you either don’t know how to do or don’t enjoy doing. For example, if you’re not technologically savvy, why take the time to learn how to integrate MailChimp with your WordPress site – which might take you hours to research and try out – when you can hire it out to someone who can do it in 20 minutes? Now that we have a better idea of what to delegate, let’s look at four tips on how to delegate smarter. When you decide to outsource your work, decide beforehand which duties will be outsourced and which will be automated. You might come to find out you can use a few tools like Hootsuite for social media posting, IFTTT for your workflow, or Shoeboxed for tracking receipts to lighten your load. And for other work, like content creation, digital marketing and accounting, outsourcing is your best option. The best system for solopreneurs is one where you can automate menial tasks and outsource time-intensive tasks or ones you don’t know how to do from your day. You have a blog on your business site and you’re struggling to come up with topic ideas and fresh new content on a weekly basis. While you think it might be a good idea to hire one person – let’s say a virtual assistant – to cover things like blog management, managing your email inbox, and social media marketing, you’re going to find this contractor may know how to do these things on a marginal level, but isn’t an expert in any of these tasks. Find the tasks you want to delegate and match those tasks to a contractor with such expertise. So for your blog, hire a freelance writer. For your social media marketing, hire a social media manager. Once you find someone for a particular task, it’s important to explicitly convey the duties they are responsible for. Coming up with topic ideas? Write down your expectations for the new contractor. Cover things like how the work is delivered, what a completed task compromises or the format of the work involved. You’ve been running your business on your own for the longest time and now you’re giving up control over certain aspects of your business to a new freelancer. So, to give you any peace of mind, you begin to micromanage. Analyze every thing they do – or don’t do – in an attempt to take back control. But, micromanaging your contractor’s work will just ruin any benefits of outsourcing in the first place. The added time and extra effort you put into monitoring their performance and their productivity will eat up any time you have to devote to the CORES of your business. Instead, you’ve got to hand over the reins and walk away. Hold your contractors accountable for their work and focus on what you need to do for your business to grow. Running your own business has been a dream of yours. It’s something you’ve always wanted to do. But, you never realized how challenging doing it all alone can be. It’s okay to work for yourself, but not by yourself. As a solopreneur, delegating is something that must occur for the growth of your business and for your sanity. Take the time to find the tasks you can delegate or automate, and make sure you find the right person for the right type of work. And when you can be confident they understand your expectations, avoid micromanaging their performance. Over time, outsourcing your work will not only be easy to do, but you will look forward to the extra time you’ll have and to thinking about how you can use that time to grow your business. Over to you – have you thought about delegating tasks? What’s holding you back?